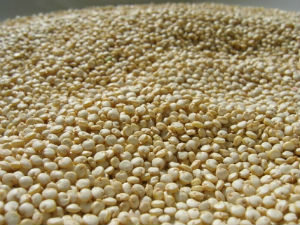 Quinoa ("Qin-wah") is small round grains which look similar to millet. It has pale brown colour. Quinoa is a popular agricultural products in the Andean region of Ecuador, Bolivia, Colombia and Peru. It was important to the diet of ancient Andean people. Quinoa tastes mild, with firm texture and slightly chewy. After cooked, the grains sweeten and become translucent, ringed with white. By comparison with common cereals, Quinoa is fully packed with nutrients. It contains essential amino acids such as lysine. It is a good source of dietary fiber and phosphorus. Quinoa is also high in magnesium, calcium, and iron. One important factor is that Quinoa is gluten-free and therefore it is easy to digest. For these reasons, quinoa is called super foods. In general Quinoa seeds can be cooked in the same way as rice. It can be used in a wide range of dishes. Quinoa leaves are also eaten as a leaf vegetable, much like amaranth.